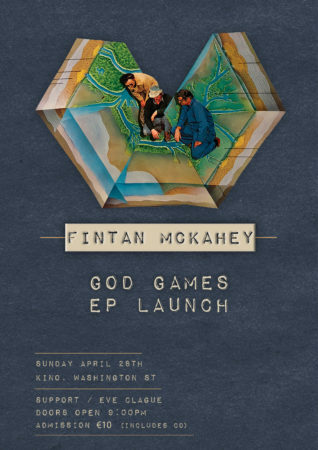 Songwriter Fintan McKahey is the 23 year old son of Stump drummer, Rob McKahey, and the nephew of Cousteau singer, 23-year-oldy; both Cork artists whose songs charted both in the UK and Europe. Fintan grew up in West Cork and is continuing the family legacy, producing his own eclectic, down tempo, alt-pop music in the style of Ben Howard and Chet Faker. His new EP, GOD GAMES, is inspired by both the rugged landscape of his own homeland, and influenced by his travels through Kenya, Thailand and Peru, where Fintan spent time with indigenous cultures exploring alternative belief systems. The title track ‘God Games’ is a love song, which invites the listener to transcend the mundane, venture forth and imagine other realms. In contrast, ‘Cultural Trance’ is an observation and commentary on his own personal journey through current pop culture. It follows the success of his more folk-based debut EP, Two Lifetimes Late, which was received well after it’s release in 2016, and played on KCLR, Corks Red FM, Corks 96FM, Wandsworth Radio and Croydon Radio in the UK. A Irish and UK tour will kick off with a Cork city launch at The Kino on Sunday 28th April. This will be followed by gigs in Ireland and the UK, which he will play with his full band. Several tour dates are linked to local festivals. Levis’ in Ballydehob hosts the West Cork EP launch on 10th May. The Ring O’ Bells, Bristol, UK on 17th May. Hacketts Bar in Schull on 26th May, coincides with a screening at The Fastnet Film Festival of ‘Fintan: Genesis of an Artist’ a short music documentary made by the award winning film maker Stephen Bean, which explores the creative development of his new GOD GAMES EP. The Bru Bar in Cork on 31st May starts off the Soul in the City Festival over for the bank holiday weekend. The Mariner in Bantry on 15th June & DeBarras in Clonakilty on 28th July.